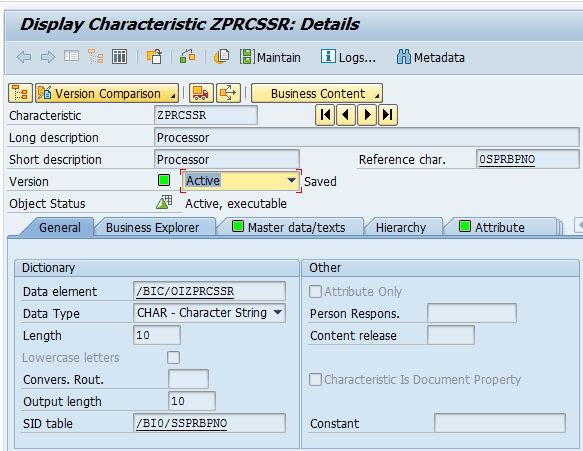 Virtual Characteristic / Key Figures are used when Info Object values determination in runtime of SAP BEx Query execution is required. 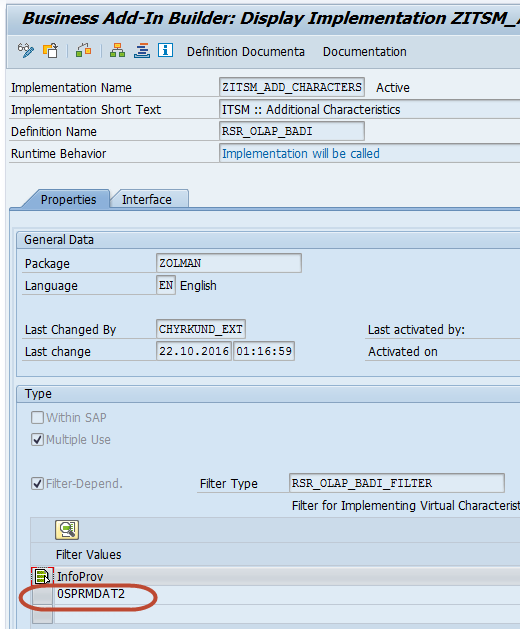 Virtual Characteristics/Key Figures are used when no transformation rule exists to populate them in SAP Cube/DSO. Virtual Caracteristic/Key Figure values are calculated using either SAP BADI (RSR_OLAP_BADI) or SAP Enhancement (RSR00002). To update SAP BI Reports for SAP Solution Manager (SOLMAN) the external engine for data collection in the cubes/DSO is used. 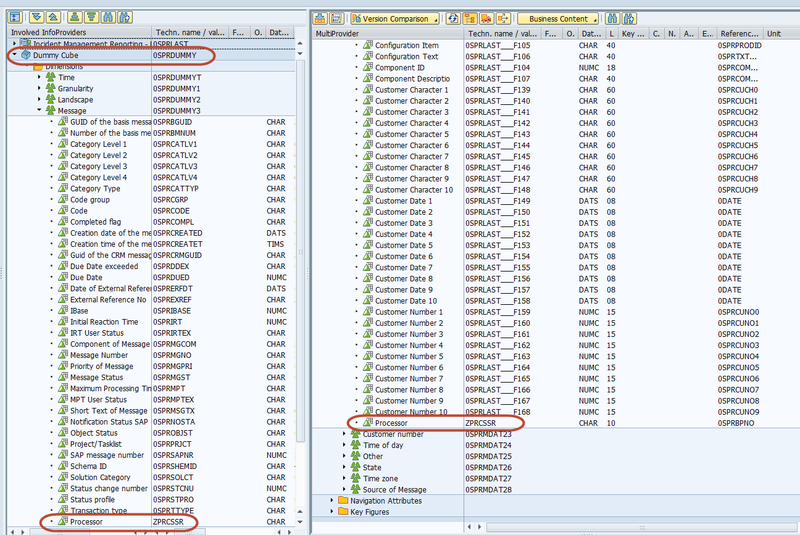 There is no SAP standard BI data flow under SOLMAN cubes, the data are loaded via customizing inside SOLMAN and modules. It this case BI cubes enhancement with additional attribute can not be done easily and quickly. Based on the customer requirements, it was necessary to build a report with two additional columns: Reporter Name and Processor Name. So, for each IT incident or Service request it was necessary to show Reporter Name and Processor Name in the same line as the ticket number. But in standard SOLMAN info cubes there is one characteristic ‘0SPRBPNO’ Business Partner for all roles of business process participants (Payer, Customer, Processor, Sold-To-Party, Reporter, etc.). The roles of every Business Partner are defined in characteristic ‘0SPRBPROLE’ Business Partner Role. So, it was not technically possible to show two Business Partners for the same ticket number, because there is only one characteristic ‘0SPRBPNO’ Business Partner in the cube. The solution was found via enhancement of Multiprovider with one additional characteristic with Role 0SPRBPROLE = SLFN0004 “Processor”. The Processor was filled in run time of BEx query execution. 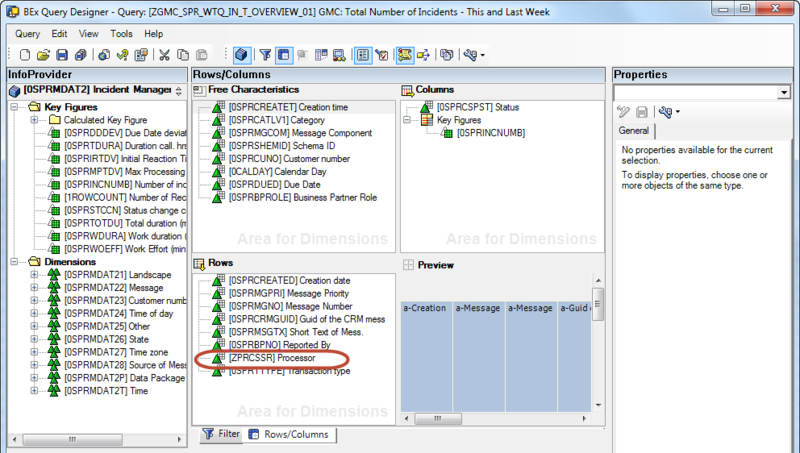 Query ‘ZGMC_SPR_WTQ_IN_T_OVERVIEW_01’ GMC: Total Number of Incidents – This and Last Week is built on Multiprovider (0SPRMDAT2). At the tab page “Interface” a new class creation should be done. 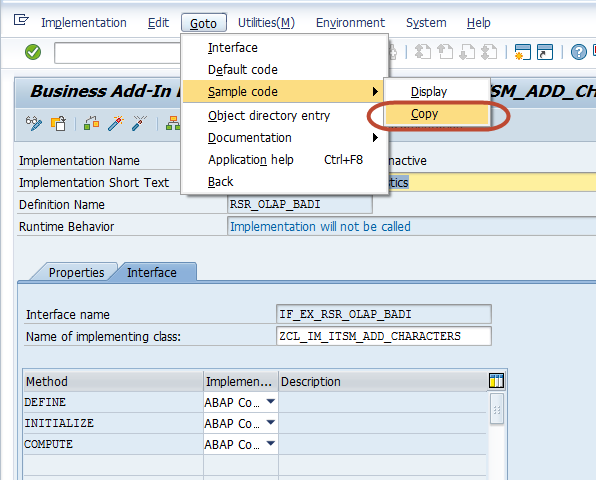 The next step is the creation of the ABAP Codes for the methods IF_EX_RSR_OLAP_BADI~DEFINE, IF_EX_RSR_OLAP_BADI~INITIALIZE and IF_EX_RSR_OLAP_BADI~COMPUTE. 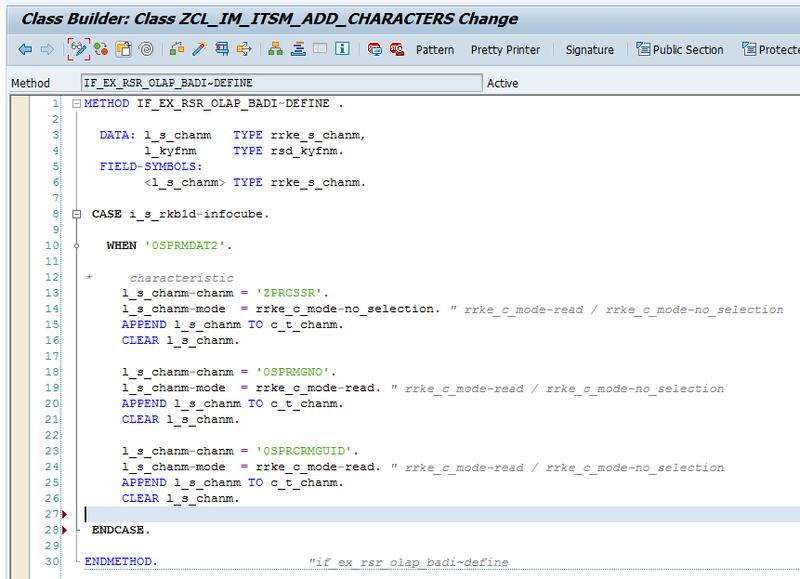 The Method is used to append the internal tables for the Characteristic (c_t_chanm) and Key Figures (c_t_kyfnm). * APPEND l_kyfnm TO c_t_kyfnm. The Method is used to dynamically assign random numbers to the Characteristic and Key Figure Variables. It is filled in as a result of Step 4. * with name P_CHA_<characteristic> TYPE i. * P_KYF_<key figure> TYPE i. WHERE value_returnnm IS NOT INITIAL. It is used for defining business logic for assigning the values to the characteristics or KeyFigures. ASSIGN COMPONENT p_cha_0sprmgno OF STRUCTURE c_s_data TO <fs_0sprmgno>. ASSIGN COMPONENT p_cha_zprcssr OF STRUCTURE c_s_data TO <fs_zprcssr>. ASSIGN COMPONENT p_cha_0sprcrmguid OF STRUCTURE c_s_data TO <fs_0sprcrmguid>. SELECT SINGLE sprbpno FROM /bi0/asprdatb00 INTO <fs_zprcssr> WHERE sprcrmguid = <fs_0sprcrmguid> AND sprbprole = ‘SLFN0004’. 1) fs_0sprcrmguid : is data for this coming from multiprovider ? 2) fs_0sprmgno : where this field is used ? and 0sprmgno is defined but not used. 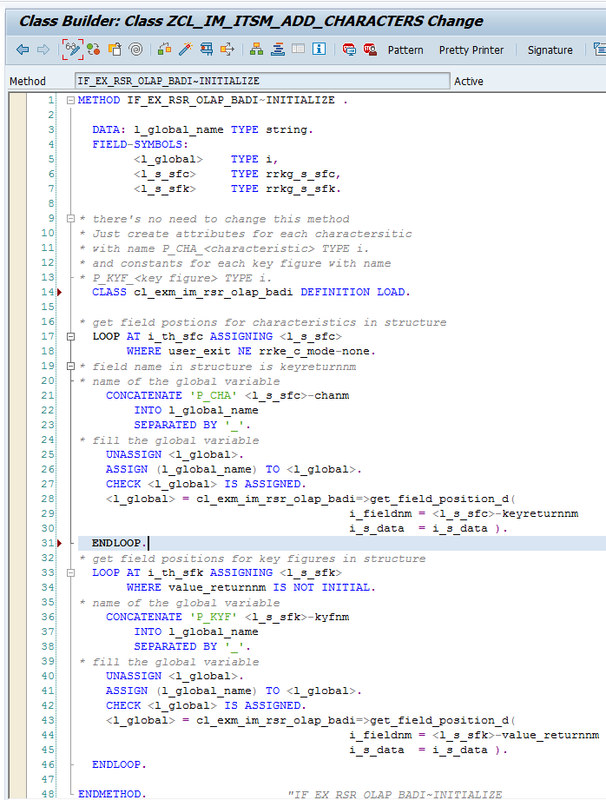 3) P_CHA* – why its defined as I as associate type ?